In 1997, IBM’s Deep Blue computer won a six-game chess match against world champion Gary Kasparov. More recently, IBM’s Watson supercomputer defeated two of the greatest Jeopardychampions of all time during a three-day competition. Despite these impressive exhibitions, machines cannot think like humans – yet. For example, given different sets of information, humans have a natural ability to detect patterns and perceive order. Computers, on the other hand, must be told what types of pattern structures to look for. 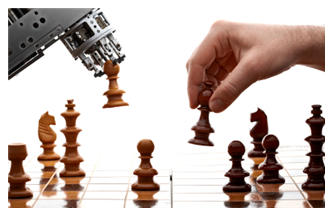 But Deep Blue and Watson have demonstrated that when the rules of the game are well defined and the desired patterns are known, humans can program computers to solve these problems better or faster than our own minds can solve them. Another example is engineering design optimization, where mathematical computer algorithms are being used to optimize engineered systems and components. In this context, the roles of mind and machine are still being debated. Unlike in chess or Jeopardy, no one has proposed a suitable competition to determine whether machines can outperform humans on design optimization tasks.